Shrugging off concerns about the global economic crisis, Dubai has announced that it is planning to build a tower reaching over 1km. The announcement was made yesterday (Sunday) by local developer Nakheel’s CEO Chris O’Donnell in an international press briefing. Dubai VIPs and other guests including Michael Douglas and his wife Catherine Zeta-Jones were later told about the plans at a party held in the recently-launched Atlantis hotel on Palm Jumeirah. Nakheel (Palm in Arabic) is a Dubai government backed firm and has been behind the famous Palm and World developments. This project, which will be made up of mixed use products, will cost over USD30bn. Mr O’Donnell said the structure would be the centre-piece of an inner-city harbour (‘the world’s first’) and would become the emirate’s unofficial capital. The tower and harbour project will take more than 10 years to complete. 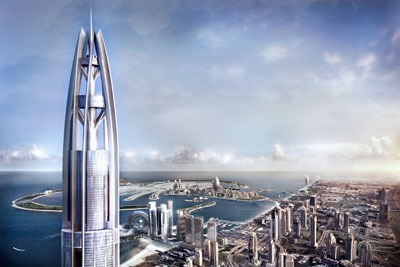 Apart from the landmark structure, there will be another 40 towers, ranging in height from 20 floors to 90 floors. The entire development will be home to more than 55,000 people and a workplace for more than 45,000.